So yeah, this episode for me was a bunch of references galore, lots of giggles (the faces, though), and a barrel of fun for me. What did you guys think? Discussions Below! I loved this episode so much I MADE A LIST OF THINGS I LOVED ABOUT IT AS I WAS WATCHING. And then I CATEGORIZED those things into sub-categories of things I loved because they were funny and things I loved because they were adorable. Open Skies, Clear Skies, and Fluffy Clouds. I got the most Abbott & Costello vibe from this scene. And this scene was only the first of several times this episode had me literally laughing out loud. Plus, just the other day I was discussing the naming conventions of Equestrian society with a friend at school and these are exactly the kinds of silly names we were talking about. Fingers crossed we get a character named Rain Shine by the end of the season. "Winter is Coming". That is all. And of course, knowing me, how could I not love "Applejack cries on the INSIDE, Twilight!" "It's true." Again, laughing out loud between my d'awww-ing at the pony cry pile on Dashie's bed. The aforementioned pony cry pile, and Fluttershy's attempts at comforting Dashie. Those winter outfits the Mane 6 wore in the last scene. I am eagerly awaiting the fanart people make of the ponies in those outfits. 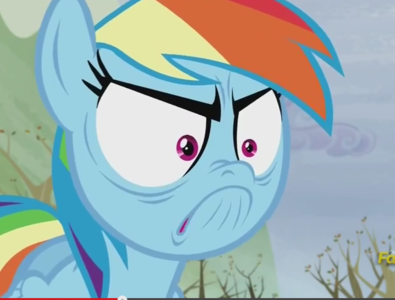 Also, pretty much every face Dashie pulled this entire episode. On the less enthusiastic side, this being Dash and Tank's first winter is pretty much giving a middle finger to the continuity. Which is too bad because there was so much continuity going on with the Running of the Leaves and Winter Wrap-Up. But there is no way it's been less than a year between May the Best Pet Win and Tanks for the Memories. No. Way. Despite that, I still loved all the other previously mentioned stuff, and GOOD GOD the weather factory scenes were incredible. That drawing on the door of the locker Dash and Tank hid in made me smile, and the whole thing was just... Perfect. OpenClear Skies is my new favorite shipping. So before I start, I apologize for being a hater on this.. Please don't behead me.. The OpenClear Skies gag was one I recognized instantly as a reference to "Who's On First." Instantly my favorite part of the episode, no doubt. One thing I can harp on this episode, however, was... again... the song. To me, it felt so... uninspired. It literally came out of nowhere, and it really wasn't unique in any sort of way. Not to mention it wasn't all that well-performed, either. I'd actually be more inclined to compare this song to that of Castle Sweet Castle's song. Overall, the song for this episode didn't really fit the tone too well. Here rainbow dash was, out to destroy christm- I MEAN WINTER, and she begins to sing an upbeat song about it. You could argue that it was upbeat because she believed she was doing something right for tank, but even so the song then kind of loses a sense of purpose. I think I'm starting to see a pattern, though. It's really way too early to call this one a pattern, considering we're only 5 episodes in... But I think this one has some kind of spark to it. In each of the episodes we've seen so far, there have been instances where differences cause issues or problems. In castle sweet castle, we see that each of the main 5's senses of style conflict with each other, thereby kind of ruining twilight's castle for a short period. In Bloom or Gloom, Applebloom is afraid that her cutie mark, the one thing that makes her different from her friends and (possibly) family, could ruin her life. In this episode (this one is a hell of a stretch, to the point of pretty much not counting it), Rainbow and Tank's differences in lifestyle (and biology) cause a separation between the two of them for an entire season of the canonical year. Again, this pattern is entirely baseless, but it makes me wonder. Speaking of patterns this season, I would just like to point out that alarms were going off in my head when RD brought into question Fluttershy's animal expertise. Like, we've seen in the past that questioning a pony's special talent never ends well, and for a season in which Hasbro has explicitly stated that they are going to be looking in depth at the meaning of a Cutie Mark, I really felt like this could be some kind of foreshadowing. Also, I seriously forgot there was a song when I did my first write-up. Eh, it was okay. I liked it better musically than Make This Castle a Home, but I do agree with bt that it seemed tonally out of place for the episode. Now if you'll excuse me, I need to go re-watch Who's on First and then go write a headcanon about OpenClear Skies shipping. I just finished watching the episode, and I thought it was quite good. The song was amazing. The scene where Rainbow Dash sabotages Cloudsdale was fun to see. It broke my heart seeing Rainbow Dash cry about Tank, but Pinkie Pie managed to make that scene funny at the end. Overall, I give this episode 10 out of 10. Hmm... I have mixed feelings about this episode, to be honest. Although I really enjoyed seeing Dashie showing her soft, loving side, her reaction to the whole situation was way too extreme... The circus-like surrealism of the premise just rubbed me in a wrong way a bit. I agree with bt and triq wholeheartedly on the song. The overall joyful atmosphere did not suit the opposite vibe of the episode and musically, it was forgettable as well. The obvious problems and contradictions with the continuity did not really bother me, even though I love continuity but my expectations on that regard as not as high in MLP as they are with other media products. On the other hand, despite all of this, the writers managed to get me to go along with the ride mainly because of the clever references, the numerous funny moments and puns, the incredible voice acting, the amazing sets and animation (especially facial expressions; it appears they have developed their skills on that A WHOLE LOT since the last season) and basically the powerful emotional charge of the episode, even though Rainbow was willing to disturb the balance of nature and put lives in danger, not to mention sabotaging and ruining the hard work of dozens of other individuals because of selfish reasons. How LOYAL of her! And as someone who's job was to determine certain patterns, I too have the feeling. furthermore, inclining to believe that we'll see a certain pink unicorn throughout this season, although the current amount of information is still not enough to state that safely. All in all, There were many parts of the episode I disliked, but there were just as many parts which I did like so I would give it 4 stars out of 6. You guys don't get the undertones for these episodes, do you? It's a metaphor for death. Think about it. She's going through all the stages of grief in this episode. DandC, there's a difference between not getting undertones, and choosing not to interpret things a certain way. Don't bash on people just because they don't choose to interpret the episode the same way you do. I'm not bashing. But you guys aren't even considering it. If you did, you would mention it. And I don't think Rainbow is overreacting intensely. Imagine if your best friend is going away for several months, and there was no way to keep in touch with them at all. Maybe we don't want to consider it. freakin' BURYING TANK INTO THE GROUND? Yeah, I considered it, I knew it, that inference has already been done to death in the DAY this episode has been out, so I didn't bother to even mention it. I figured it was common sense already. I mean, every popular reviewer I've seen that has already reviewed this episode mentioned the whole "death undertone" thing at least once.